The Beats featuring Dale Dahmen on Concertina from the Heart of Minnesota! This CD contains concertina featured music with Dale Dahmen and The Beats. 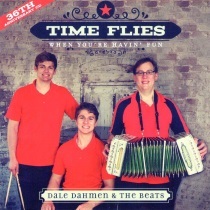 “Time Flies When You’re Havin’ Fun” is the title of this New CD featuring Dale Dahmen and his sons Dominick and Samuel. Don’t pass this CD today!